I recently had the pleasure of attending UNO’s Pumpkin Beer Festival with a good friend of mine; who also happens to appreciate good beer. 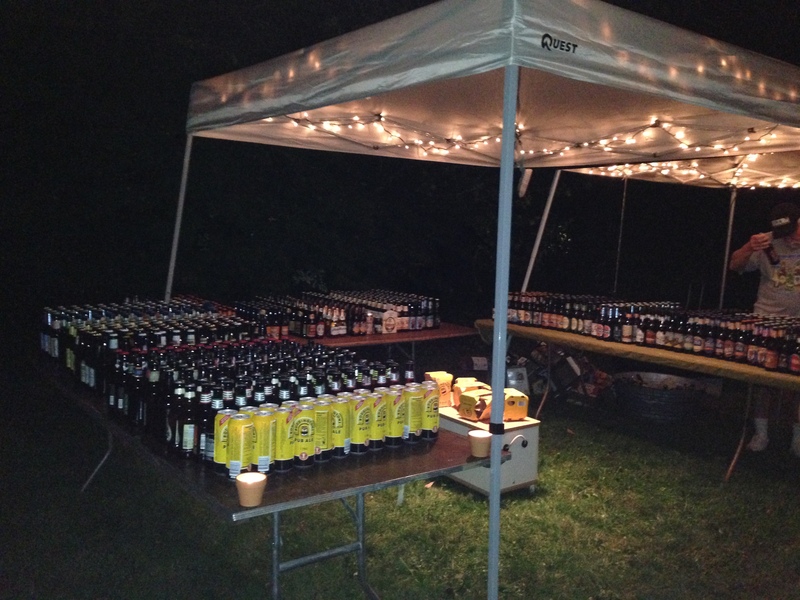 The festival was set up as a scaled down Beer Festival. On either side of the main building they had outside beer tasting tables set up on patios. Between the two patio areas there were 24 Pumpkin and Oktoberfest beers to try and inside at the main bar there were another 9 beers available. All areas also had water stations set up for the patrons – smart move. The main patio also had three different games people could participate in. (bag toss, washers, corn hole). We arrived at the festival mid afternoon and upon paying for our tickets received a pretzel necklace for munching on during the tasting. There was was small crown outside but the main bar was full. There might have been some sort of sporting event on but, ummm, who cares. We made our way to the main patio and made our choices. I purposely stayed away from the beers I had tried before even though some of my favorites were available. However, I was there to try some NEW beers, well new to me, have fun and catch up on solving the world’s problems with my dear friend. I started with the 21st Amend Pumpkin Triple 8.2%. This was a delightful beer with a nice golden to amber color that had hints of banana and mild citrus flavors. There was not an overwhelming flavor of pumpkin or spices they were more background notes. Over all this was a very enjoyable beer. My friend enjoyed Ommegang Seythe & Sickle 5.8%. I took a small sip and it was a bit hoppy for me but not overwhelmingly so. One can smell the spices and it was a delightful orange color. Next up for myself was the Cape Ann Pumpkin Stout 7.0%This beer pour a dark rich black with a nice creamy head and was so pretty to look at. One could smell the roasted malts right away. True roasty malts with chocolate, pumpkin and coffee and blended perfectly together. It ended with that nice stout bitterness I’ve come to love. Being a true beer friend my companion for the day allowed me to try her Flying Dog Dogtoberfest 5.3%. This was a nice amber color and had sweet malty earthiness to it. It was crisp and perfect for a nice fall day. I consider this beer a true Oktoberfest beer. At this point we decided to make our way over to the other outside area and some fun was had here. I wanted to choose wisely and not pick 8 oz. of beer that I didn’t like or did not want that much of. The staff was very willing to pour tasters so one could choose wisely. My tastes were of Neshaminy Creek Punkel Dunkel 8.8%. Last time I tried one of Neshaminy beers I came away feeling that with time this new brewery would grow into it’s own and produce some nice beers. They did just that with the Punkel Dunkel. In early September I tried their Dunks Ferry and although it was enjoyable I felt it had brewed by someone with not a lot of experience taste. This current selection was the opposite and was very nice…a good Dunkel. However, I was looking for something with a bit more flavor so I moved on. Next I tasted the Cisco Pumpkin 6% (reminder the tastes are 3 sips worth so I wasn’t drinking as much as it seems) Something about this beer just did not taste right to me. I wasn’t crazy about the overly abundant carbonation level, no pumpkin what so ever and just an over all weird taste. For my full (8 oz.) pour I went with the Round Guys Pumpkin Porter 4.5%. Yes, I have to admit I was drawn in by the name. This beer had a nice mild smoky quality to it with roasted chocolate malts and a mild pumpkin flavoring that I found to be enjoyable but was happy it was only 8 oz. pour instead of 16 oz. My friend enjoyed a Great Lakes Oktoberfest 5.6%. I’m going to go on record and say that I feel Great Lakes Brewing is one of my favorite breweries and several years ago had the pleasure of visiting the brewery. This was a delight Oktoberfest with hints of caramel, malt and some nice toffee undertones. There was a slight hit of hops but very complimentary and not overpowering. As far as I’m concerned another success from Great Lakes! Next up my friend had the Left Hand Oktoberfest 5.6%. Overall this was a very enjoyable beer with some nice malt, nut and slight citrus tones to it. A delightful medium body beer and perfect for the season. My final selection was Lancaster Pumpkin Pie 7.7%. This was what I had been waiting for a pumpkin pie on tap. Right away you can smell the cinnamon, nutmeg, allspice, brown sugar, caramel and cloves along with a wonderful roasted pumpkin pie cooking in the oven aroma. Heavenly! This beer much darker than I expected which quite frankly made me very happy as well. It’s a wonderful sipper beer that has a creamy quality to it and low carbonation level, which I love. Overall a very delightful pumpkin pie, I mean beer. All in all and very fun fall afternoon with a very dear friend who I’m so happy also enjoys tasting different beers. Recently a fellow beer lover stopped by and I thought I treat both of us to a mini Barely Wine tasting. I’ve been aging a few in my beer/wine cellar and chose three for us to taste. This particular barley wine aged beautifully. It had mellowed out some but was still full bodied. The Monster poured nicely and was a nice dark ruby color. It had a hint of sweetness to it similar to cherries and a lovely taste of caramel as well. The flavor lasted well after drinking it. Old Crusty has always been one of my favorite barely wines and although this was still very good I fear it may have aged a bit too long. This particular bottle had a stronger bitter after taste than before. Granted this particular barely wine has always had a bit of a bitter after taste but it was more prevalent from aging. Over all it still tasted delightful with hints of raisin and brown sugar. The hops are prevalent as well. Still one of my favorite Barely Wines to par take in. I did not see a date on the bottle but I know this was at least 13 years old. The bitterness is not as strong in this barely wine. There was a full head on this ale that lasts throughout the drinking period. One can smell the hops right off the bat. This is a full body ale with toasted malts and a bit of bitterness and a mixture of toffee with hints of fruit. On the 10/4 I had the pleasure of attending my first, and certainly hope not my last, Beer Exchange. It was so much fun. My fellow beer buddies and I had giant smiles on our faces the entire time and were amazed when we first arrived and saw the abundance of good beer waiting to be picked. I was downright giddy with excitement and I think it’s safe to say so were my fellow beer pals. Each person participating in the Exchange brings 1 6-pack for the community coolers and 1 case of beer for the picking table. The case can be a mix or 24 of the same. If you are not interested in participating in the case exchange you can just bring a six pack and kick back and relax with a beer. Also, several none drinkers where there as well and just enjoyed socializing. The group was very inviting. Upon arrival we were directed to the beer tables. 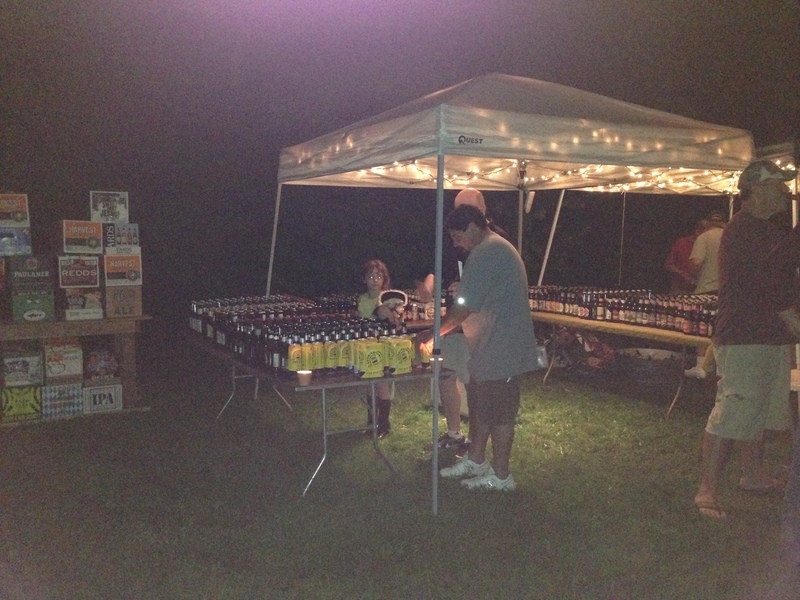 The tables were set up under a tent with lighting so when it came picking time one could read the labels. There was also a bench set up in the middle to set your case on while picking. (very well thought out) After setting up my beer I placed my empty case with the others to be used later when it was my turn for picking. Then I checked in with the host. Each participate is given a number upon arrival, mine was lucky 16, then a copy of the number goes in the picking bowl plus a slip of paper with your name on it goes in the door prize bowl. As if the great beer wasn’t enough there were door prizes too! After checking in my friends and I wondered over to the community beer coolers and selected our first brew of the night. 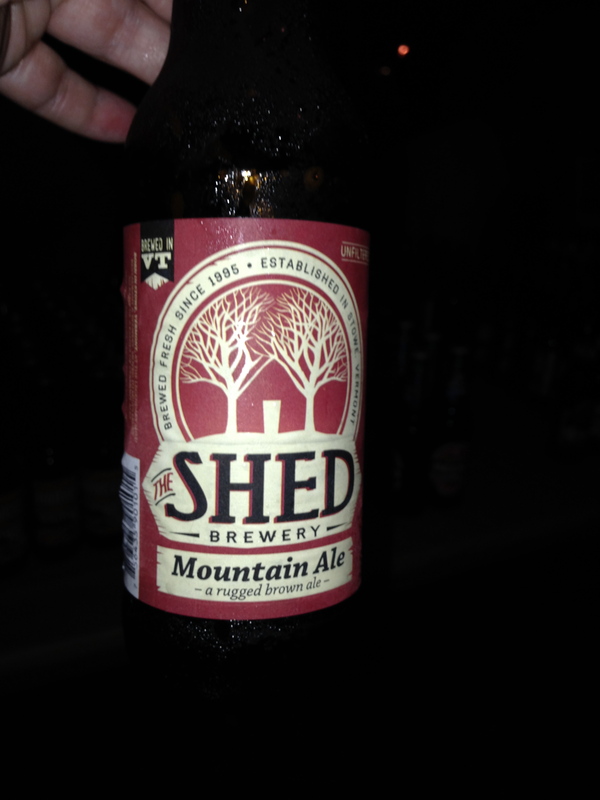 Mine was Mountain Ale from The Shed Brewery. 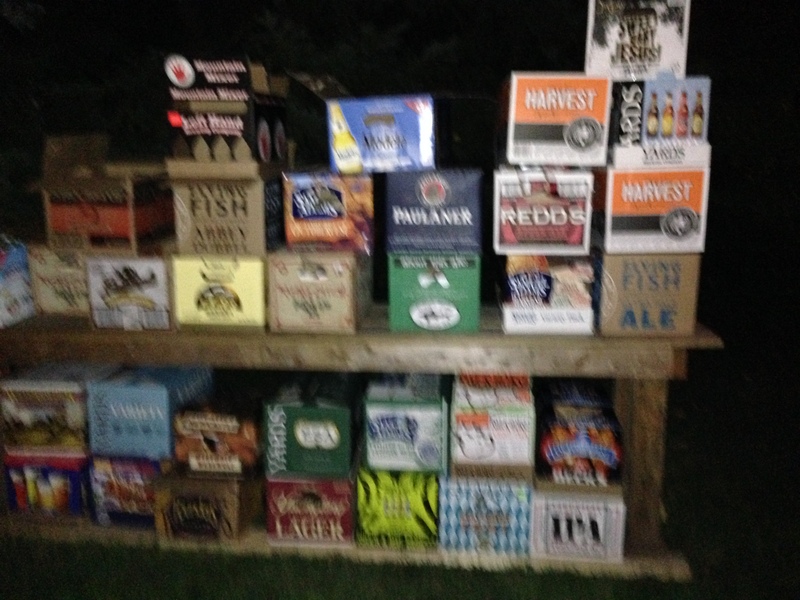 We then perused the beer picking table eying up beers we hoped would be there when it was our turn to pick. After socializing a bit we settled into our lawn chairs to enjoy our beer and wait for our numbers to be called.There was another large tent set up with chairs under for people to kick back and relax as well as chairs around a roaring fire pit. We brought our own chairs and water but wasn’t necessary. The hosts had everything well thought out and provided chairs and a large cooler of water. Plus, there was a table with all sorts of food on it for the guest to enjoy. Not long after arriving and getting settled the hosts gathered everyone around to explain the picking rules and to make sure everyone knew where the bathroom was. While listening to the rules I enjoyed a Rogue Dead Guy Ale. When your number is called you take the case you originally came with to the picking table and pick 12 beers of your choice. After everyone has gone and picked their 12 we then go again in reverse order that the numbers were originally picked. Very fare way of doing it. Otherwise, the person who goes last would just have what is left over and not really get to pick what he/she may want to try. So the last number picked gets to choose all 24 at once. If someone has to leave early then when their number is called they get to pick all 24 at once. While numbers are being called so are door prizes. 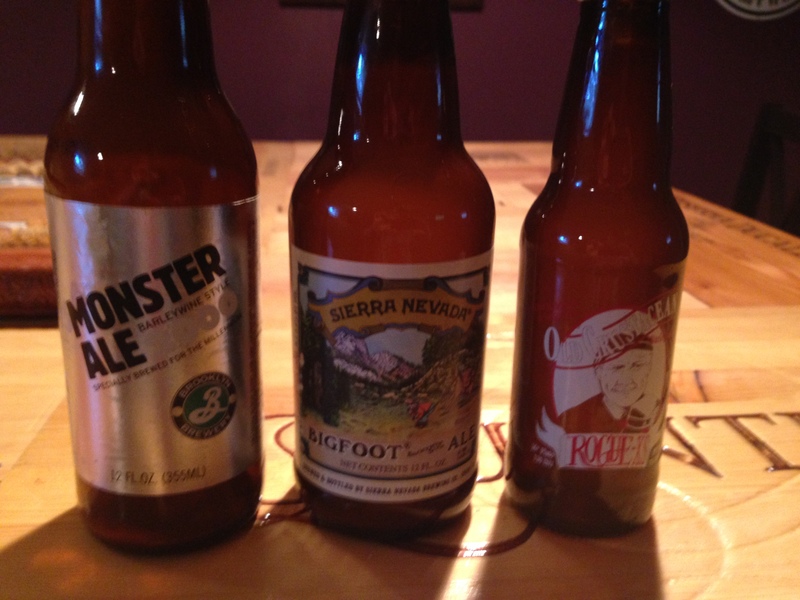 The prizes ranged from the goofy mardi gras necklace to amazing beers. Very nice touch provided by the hosts. About midway my number was called and I have to say it was a bit overwhelming trying to choose my first 12. You really want to look through them but at the same time not slow everyone else down. I did scope out the lineup early in the evening so I had some I knew I wanted to grab but others I planned on where already gone. While I was busy choosing my beer one of my buddies had her named called for a door prize and won a Samuel Adams hat. It looked great on her. While waiting for my turn again I enjoyed a Sweet Baby Jesus Chocolate Peanut butter Stout and a Leffe. 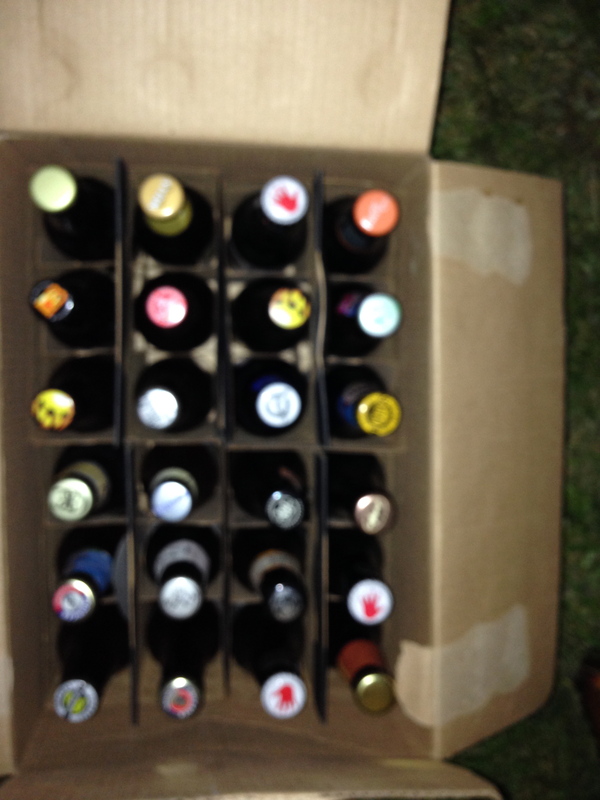 After my beer buddies and I picked our final 12, which didn’t take as long as the first 12 since so much was picked by this point, we happily packed up each of our cases, thanked the hosts and left with huge grins on our faces. Others stayed and hung around the fire and the beautiful night. Super fun evening and I encourage you to gather some friends and friends of friends and plan your on Beer Exchange. I’ve been anxious to try what I had hoped would be a delicious slice of night sky. Every place I checked it was already sold out and in some places a waiting lists were formed; needless to say I was frustrated with my failure to acquire a bottle. Then I had the pleasure of getting together with some wonderful beer friends and one of them had brought a bottle of the Warlock. I was ecstatic when I saw the bottle. It pours like midnight gold which had my mouth watering. The first thing I smelled was vanilla, more like extract than fresh vanilla. My mouth was watering a bit less at this point but still had high hopes. The first sip I could certainly taste the vanilla and a bit of roasted malts with slight nutmeg and cinnamon flavors. The beer is promoted as an imperial stout brewed with pumpkins. I didn’t taste any pumpkin. On the second and third sips I just tasted more and more vanilla; to the point it overpowered all other flavors. In the end it was disappointing and left an extract waxy coating in my mouth. I would like to try a bit of the Warlock mixed with the Choklat and see what how they work together. I think the Choklat would help tone down the vanilla in the Warlock.